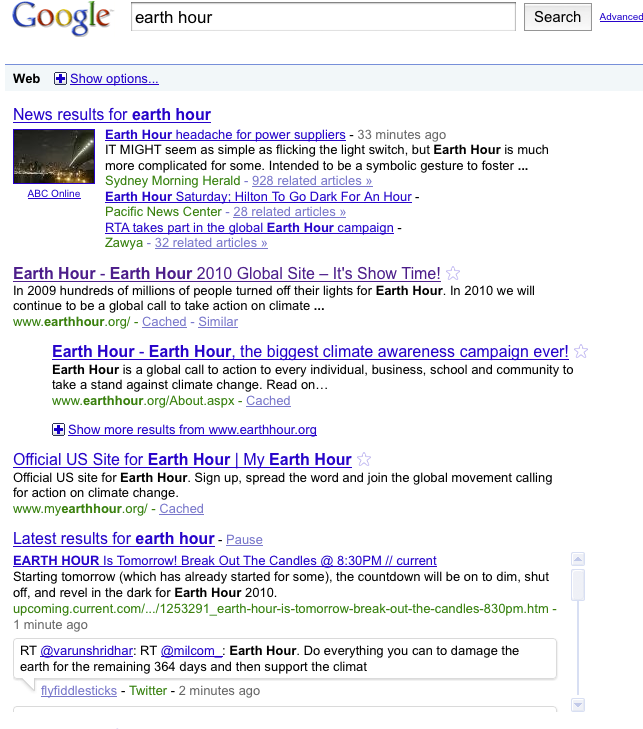 In this case, I searched for “earth h….” and it suggests “earth hour 2010” But on top of that, it inserts a link to the most relevant website directly. Smart and time-saving, i suppose. Also, it does not clutter the suggestion box completely. Adding link to all suggestions would clutter the box, I think. Notice that scrollbar in the bottom of the screenshot: The result page keeps updating. This entry was posted by Jesper Rønn-Jensen	on Friday, March 26th, 2010 at 14:53 (GMT-1)	and is filed under Usability, Web Development. You can follow any responses to this entry through the RSS 2.0 feed. Both comments and pings are currently closed. Thanks for the update. I noticed the real-time news updates yesterday; I think they will prove valuable when I am researching a breaking news story. Cool timesaving feature. It has not yet come to Denmark. This direct linking would save a lot of valuable time for the people who find information using google. 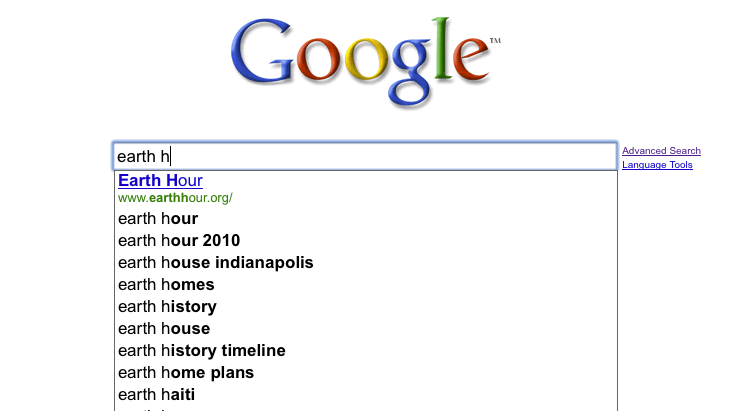 Google being the homepage for many users worldwide is often used as an address bar instead of a search engine. This provides the users with an option to go directly to the website instead of hitting “I’m Feeling Lucky” or viewing the search results. Thanks to Google, for another small yet interesting way to help it’s users. This feature could be used to drive more traffic to your website. The only difficult challenge is trying to get to the most relevant result lol. These tools are all useful, and who wouldn’t be in favor of them overriding the algo for something like poison advice… but… just having the thoughtform out in the world that they override the algo in certain cases… how is this going to affect people’s trust of their search results? 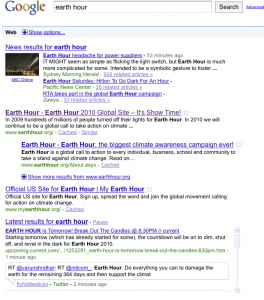 I’ve heard talk recently that Google is favoring “brands” in certain search results. Is this through an override also? Is this cronyism? Or an admittance that the algorithm has failed to beat the gamers in certain instances….? I think the direct linking would be a great feature. Looking forward to see it in action. Another feature which I recently came across is the ‘Profile results for’ which appears when searching for people. I am not sure how new this is but I have only just noticed it. Try running a search for Matt Cutts, it usually appears at the bottom near the 10th position and has direct links to MySpace, Facebook, etc. I haven’t actually noticed this yet. Did they remove it?